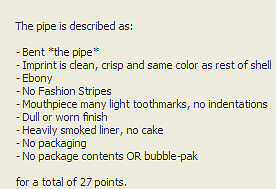 The value of pipe #022 is 27 points. Baker Egerton told me of this pipe being offered on eBay and I entered my bid. In due course, I got the pipe from Doug Whitney. Eventually, I got an example of the shape/color unsmoked in original packaging and this one went to the Pipes for Sale or Trade page. Warren Judd took a liking to it and acquired it.